A capacitor is an electrical device which stores electric charge, whereas a dielectric is a material that does not allow current to flow. Dielectrics are often called insulators as they are the opposite of conductors. All the electrons in a dielectric material are bound tightly to their parent nucleus, so no free electrons are available to carry the current. Thus the electrical conductivity of dielectrics is very low. Let’s take a good look at how the two are related to each other and how they differ in function, properties, and uses. A dielectric is an insulating material with a poor conductor of electric current but an efficient supporter of electrostatic fields. It is a medium or substance that has the ability to withstand high electric stress without appreciable conduction. When stress is applied, energy in the form of an electric charge is held by the dielectric. Most of this energy is retained when the stress is removed. A dielectric material is more or less insulating material which becomes polarized when it comes in contact with an electrical field. Like any material, a dielectric is an assembly of ions with positive and negative charges which balance to ensure electrical neutrality. 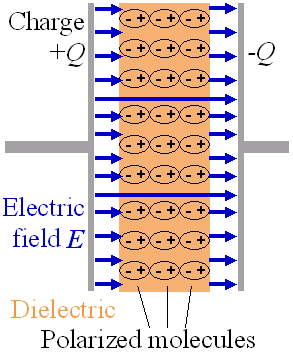 Because of dielectric polarization, positive charges are displaced in the direction of the electric field, and the negative charges shift in the opposite direction of the field. A capacitor is a two-way electrical component consisting of a pair of conductors separated by a dielectric insulator. It is one of the most fundamental passive components with the ability to store electrical energy in an electric field. It’s their capacity to store electric energy that makes them so special. A capacitor is one of the three fundamental components of a circuit, along with resistors and inductors. It holds the electric charge when voltage is applied across it and releases the charge as and when required. Capacitors are ubiquitous on high-speed circuit boards, but engineers often do not fully understand their electrical characteristics. Although, capacitors vary in size and shape, the basic configuration remains the same, i.e. two conductors carry equal but opposite charges. Capacitors are basically characterized by the material used for their dielectric as: variable air, paper, mica, ceramic, plastic, titanium oxide, and electrolytic. – A dielectric is an insulating material with a poor conductor of electric current but an efficient supporter of electrostatic fields. It is a medium or substance that has the ability to withstand high electric stress without appreciable conduction. A capacitor, on the other hand, is a two-way electrical component consisting of a pair of conductors separated by a dielectric insulator. It is one of the most fundamental passive components with the ability to store electrical energy in an electric field. A capacitor is one of the three fundamental components of a circuit, along with resistors and inductors. – Capacitors are used in most electrical circuits to store electric energy and gives the energy back to the circuit when necessary. In simple terms, the primary function of a capacitor is to store energy. There are different forms of capacitor which can be used to provide a variety of functions in different circuits. Dielectric materials have very high resistivity compared to conductors, thus they are used to separate conductors at different potentials, such as capacitor plates or electric power lines. When a dielectric is placed between charged plates, the capacitance of the system increases. – Dielectrics are non-metallic materials of high resistivity and a very large energy gap. The dielectric constant of a material determines the capacitor’s ability to store energy when voltage is applied to it. All the electrons in a dielectric material are bound tightly to their parent nucleus. With no free electrons to carry the current, the electrical conductivity becomes very low. The property of capacitors is to store energy in electric field and to increase and enhance the effect of capacitance. The capacitance is the property of a capacitor that resists change of voltage across it. – The most common use of capacitors is energy storage. Capacitors are commonly used in electronic circuits for a variety of tasks such as to provide flexible filter options, smoothing, power storage, noise reduction, circuit tuning, and more. Capacitors are additionally used in power conditioning, signal coupling or decoupling, remote sensing, and power supply smoothing applications. The main use of dielectrics is in fabricating capacitors. A dielectric material has very high resistivity, thus used to separate conductors at different potentials, such as capacitor plates or electric power lines. A capacitor is one of the most fundamental passive components with the ability to store electrical energy in an electric field. The property of capacitors is to store energy in electric field and to increase and enhance the effect of capacitance. It consists of two conducting plates divided by an insulating material called the dielectric. Dielectric is just another term for insulator. Like any material, a dielectric is an assembly of ions with positive and negative charges which balance to ensure electrical neutrality. The main property of a dielectric material is its ability to withstand high electric stress while dissipating minimal energy in the form of heat. Sagar Khillar. 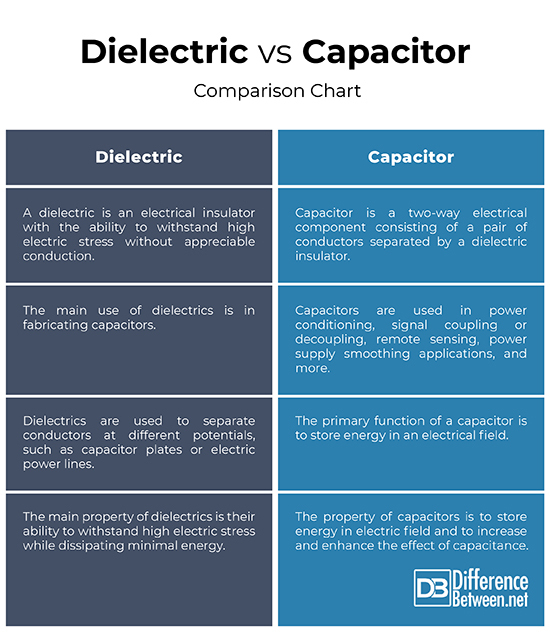 "Difference Between Dielectric and Capacitor." DifferenceBetween.net. April 9, 2019 < http://www.differencebetween.net/science/physics-science/difference-between-dielectric-and-capacitor/ >.